Jobu reacts to the Ichiro trade. So I was on the train on my way home from work yesterday and ran out of things to blog about, so I decided to check Deadspin to see if anything was going on. I immediately sent the following three texts to my friend Tom. Despite the best efforts of the auto-spelling correction on my Droid, the message was clear. I was excited about the Ichiro trade. It’s odd because I’ve always disliked Ichiro (only because he was not a Yankee). My brother and I may have even dubbed him “Bitchiro” in our younger years (we lament that we’ll be unable to keep calling him that). This trade might make for strange bedfellows, but I have my sleeping bag ready. Let’s face it, the Yankees outfield situation has been pretty dire this season. It’s tough to really make people see that because the Yankees have the best record in baseball and pretty sizable lead in the division, but the injury to Brett Gardner has really hampered the lineup and defense. It has forced the Yankees to have Raúl Ibañez or Andruw Jones in the outfield pretty much every day (sprinkle in a little Dewayne Wise and Darnell McDonald in there too), which was not the plan coming into the season. With Gardner likely out for the year now, Brian Cashman had to do something to get the team another speedy defensive-minded outfielder, and boy did he ever, getting Ichiro Suzuki from the Seattle Mariners. I like this trade for a lot of reasons. I know Ichiro isn’t the same Ichiro who hit started his career with ten straight 200+ hit seasons and set the hits record in 2004. The version of Ichiro the Yankees are getting is a little bit slower, a little less rangy in the outfield and a little less of a terror at the plate. That being said, it’s still Ichiro. A properly motivated future Hall of Famer can often rediscover the talents in the right situation. That being said, he’s still a future Hall of Famer and one of the best hitters ever to play the game. Let’s talk about who the Yankees gave up in this deal. Or I guess who they didn’t give up. Top prospects Manny Banuelos, Delin Betances, Adam Warren and David Phelps are all still in the organization. Cashman gave the Mariners D.J. Mitchell (on the ones and twos) and Danny Farquhar. Mitchell is a nice little pitcher, but he tops out as a long-man/spot starter as far as talent goes. Farquhar, meanwhile, is a guy the Yankees claimed off waivers and have twice designated for assignment this year. They got Ichiro for bargain-basement prices, which makes this trade look all the better. Anyway, I think we’ll see a slight uptick in Ichiro’s performance going forward. He’s motivated by the will to win (one of the reasons he said he stated when asking the Mariners to trade him over the All-Star break), and he’s surrounded by more talent than he’s seen the last five years in Seattle. He should come up with more guys on base and get better pitches to hit because of the guys who bat after him (unless it’s Russell Martin, then we’re all screwed). With a little time to get adjusted to the new surroundings, I think Ichiro can get back to .300, steal some bases and play solid defense, which is really all we can ask. It will be interesting, however, to see how Ichiro reacts to batting eighth instead of leadoff. I’m pretty sure last night was the first time he hasn’t batted in the first inning in his career (not counting possible All-Star games). 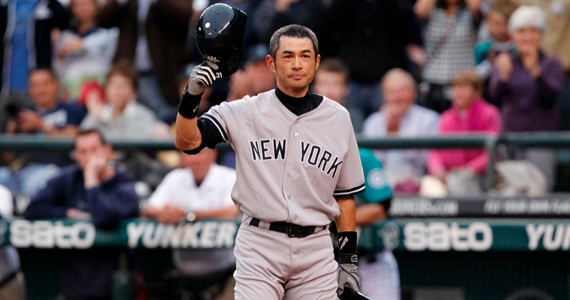 He also had to change his number to 31, because Bernie Williams might have cried if the Yankees had offered the 51 Ichiro has worn his whole career in Seattle. I, for one, think Ichiro should be batting ninth, like Gardner did. That 9-1-2 of Ichiro-Jeter-Granderson gets kind of messed up when Russell Martin is in the middle hitting .180. 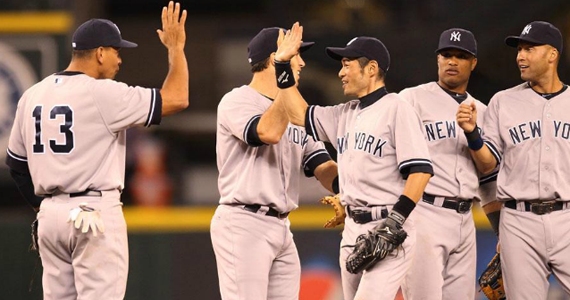 However, batting ninth is even worse than batting eighth, so how would Ichiro react to that? I think Ichiro accepted this trade because he wants to win. He’s 38 years old now and not at the top of his game, so I don’t think he’ll make a big stink about hitting down in the lineup if it gets him a nice fat World Series ring. His ego is pretty well known, but perhaps in his old age, and coming to a new team where he is no longer the guy with two lockers, he’ll put all that aside to contribute to a winning team. Also, he asked for and approved this trade, so he knew what he was getting into. You’re not going to displace Derek Jeter in the leadoff spot. If Ichiro was upset about batting eighth, he didn’t show it. In his first Yankees at bat, after bowing to the Mariners fans (it’s still very surreal seeing Ichiro in a Yankees uniform playing against the Mariners in Seattle), he laced a single up the middle to get his first Yankees hit out of the way. That was easily the most predictable thing I’ve ever seen, by the way. 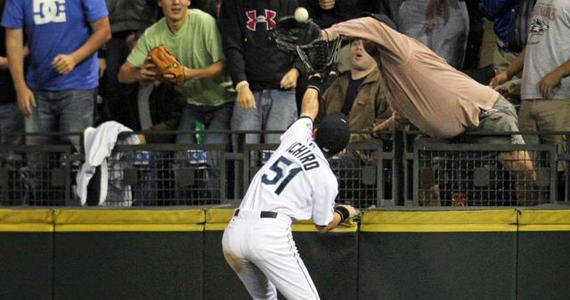 Anyway Ichiro then stole second, although he was eventually stranded at third. He popped out his next at bat before getting robbed of a single in his third at bat and hitting a line drive right at the second baseman in his third at bat. As a Yankees fan, it was nice to see he’s still got a little pep in his step. I liked what I saw in game one, but now let’s see what he can do in games 96-162. It could be a fun couple of months in the Bronx. Again, I commend Cashman for this trade. Ichiro cost the Yankees very little in both players and money, and he’s probably the best hitter any of us will ever see. In twelve seasons in the bigs, Ichiro has amassed 2533 hits. Despite down years the last two seasons, he’s still averaging 200+ hits per season and has an outside shot at 3,000 in the big leagues (he has 1,278 hits from his time in Japan too, let’s not forget). He’s a professional hitter and a great defender, and he is hungry to win, which makes him a perfect fit. 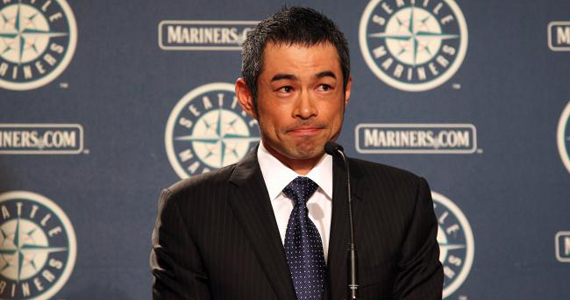 Welcome Ichiro, my former arch nemesis and future friend. He may have lost a step, but he’s still leading the league in triples, and the Yankees in SBs. Let’s just say the teacher’s union moved me… TO A BIGGER HOUSE!!!! Oh crap. I said the loud part quiet and the quiet part loud! Also, not only do you have to do math, you also have to read. and put those together in your head. I think you should look at the SAT boards for your smoking gun. Subtraction too? Is there any calculus on this thing? Also, it says “6 – one,” do i type in the number or the word for the number? Is this your way of keeping Mets fans away?